A secret tank deal by Kenya’s Army would have gone unnoticed if Somali pirates hadn’t hijacked a Ukrainian ship ferrying the 33 tanks to the port of Mombasa. The Russian built T-72 tank can run on three types of fuel: diesel, benzene and kerosene. 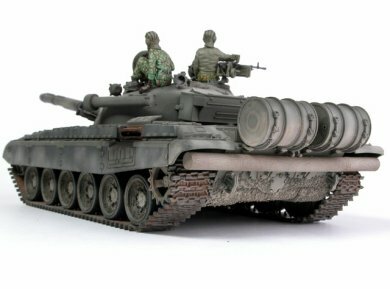 Its not clear when the Department of Defence placed an order for T-72 tanks from Russia. The Army has not explained how much it spent on the equipment, neither has it explained the role of the 33 tanks in Kenya’s security strategy. Apart from tanks, Somali pirates found tons of ammunition and auxiliary equipment within the ship, which they have threatened to offload for use in their country’s civil war. The pirates are demanding US$35 million in ransom before they release the vessel and its cargo. Typical of most African governments, Kenya’s leaders are spending billions of dollars on security while ordinary people die of hunger, disease and poor shelter. Kenya ranks at the bottom of international social and economic indicators. A growing population is putting pressure on neglected infrastructure. Public hospitals lack drugs as thousands of Kenyans perish each year on a road network broken to the point of tatters. Kenyan cities are going without fresh water due to lack of investment in water production. The capital city of Nairobi is getting less water today than it was receiving a decade ago after a colonial era dam collapsed at Sasumua. The port city of Mombasa gets water from a supply system built by the British when the town’s population was less than a third of current figures. Lack of investment in electricity production has made Kenya’s electricity tariffs the highest in Africa. Industries suffer from constant power blackouts which have undermined economic growth, leading to massive losses and job cuts. Agricultural production in Kenya is far below demand. The country is producing less coffee, maize, tea, wheat, millet and everything else compared to twenty years ago. Sugar milling companies in Western Kenya, stuck with 19th century technology, are creaking out low quality sugar in significantly less quantities than when Kenya was a British colony. Amidst all these, the Kenyan government has seen it fit to invest billions of shillings in military equipment. As stated earlier, if it wasn’t for Somali pirates, majority of Kenyans would never have known that tanks were about to get imported into the country. But, lack of priority in government procurement appears to be the norm these days. Its been announced that Kenya will spend about $23 million in the purchase of second-hand fighter jets from the Kingdom of Jordan. The F-5 fighter that the Kenyan Airforce is so fond of went out of production in 1989, meaning that the jets Kenya is buying are at least 19 years old. Kenya will also pay Jordan to train its pilots in using the junk aircraft. Meanwhile, other branches of the security forces are on a shopping bonanza. Regular and Administration police have enhanced their recruitment drives to boost numbers. They are receiving modern equipment, weapons, 4-wheel drive trucks, uniforms and riot gear. Considering the conduct of police during the post-election violence, its obvious that this enhanced expenditure is not for the benefit of ordinary men and women. The Kenya Police has just finished rehabilitating giant Russian-built helicopters fitted with night-vision equipment, gun detectors and communications technology. The helicopters will carry a team of quick response officers assisted by highly trained dogs. Just this week, the Kenya National Commission on Human Rights – a government body – blamed police for the execution of 500 Kikuyu youth and the disappearance of scores of others. According to survivors, the dead and the disappeared were all abducted by people identifying themselves as police officers. A man whose dramatic arrest in Nairobi was shown on the front page of the Daily Nation, was later found dead in the city mortuary. For most Kenyans, the acquisition of helicopters, night vision equipment and vicious dogs can only portend doom as far as personal freedoms are concerned. By purchasing bigger weapons to arm a greater number of police and soldiers, the Kenyan government is treading a path set by authorities in situations of high wealth inequality. Kenya is among the top three most unequal societies on earth. On one hand there is an extremely wealthy minority whose standard of living can comfortably secure them a place among the world’s rich and famous. On the opposite extreme is a majority of people without access to adequate food, housing, health care and education. These are people whose future is so bleak that the only options are crime, prostitution, alcoholism and violence. Amidst this depressing scenario, authorities seek to preserve the status quo by unleashing greater surveillance of the disadvantaged majority. The objective is to make life safer and easier for the rich minority. The fruits of economic growth are used to buy guns instead of building roads. Public funds are used to buy tanks instead of medicines for government hospitals. In an unequal society, the government will find it better to employ soldiers and police rather than employing doctors and teachers. Instead of facilitating constructive engagement between the rich and the poor, the system is designed to keep them apart. Such trends have happened elsewhere and Kenya is blindly going down the same path. Unfortunately, that particular path usually ends up in self-destruction, for the human spirit cannot tolerate oppression forever. In the latest embarrassment for Kenya’s government, 33 newly-ordered tanks have been captured by Somali pirates in the Indian Ocean. 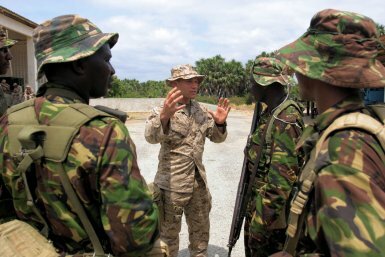 Kenya Army soldiers with a US Army instructor. Picture by the US Army. According to the Daily Nation, Somali pirates on Thursday afternoon seized a ship carrying more than 30 military tanks in a dramatic hijacking that sent ripples in the maritime industry. The BBC reports Kenyan government spokesman Alfred Mutua as confirming that the tanks were heading to Kenya. “The cargo in the ship includes military hardware such as tanks and an assortment of spare parts for use by different branches of the Kenyan military,” he said. A Russian Navy vessel is heading to the region and the US says it is monitoring developments in the area. The crisis in Somalia is back in the limelight as Somali pirates hijack dozens of ships, thereby threatening shipping routes in the Indian Ocean. Meanwhile, Islamic insurgents have intensified attacks against a US backed government and now control Somalia’s port city of Kismayu. It is feared that renewed fighting will disrupt food supplies to millions of Somalis currently living in camps and ravaged by natural disasters. Incidentally, most of the pirate gangs are based in the region of Puntland, controlled by militiamen loyal to Somali President Abdullahi Yusuf. Recently, though, pirate activities have spread to the south of the country as violence rages. Problems in Somalia worsened in December 2006, when the United States decided to overthrow the Union of Islamic Courts (UIC). By mid 2006, the UIC had succeeded in creating a functional government in Somalia for the first time since clan warfare wrecked the country in 1991. During the short-lived reign of the UIC, piracy in the Indian Ocean almost ceased but with its overthrow, piracy has grown faster than before. Pirates off the coast of Somalia have seized a Ukrainian ship carrying 30 tanks headed for the port of Mombasa, an official has said. Ukraine’s foreign ministry said the ship had a crew of 21. The tanks were ordered by the Southern Sudan government.